Man accused of riding horse on California freeway arrested for DUI. Authorities say a man accused of riding a horse on a freeway in Southern California was arrested for driving under the influence. Officers say the 29-year-old hoofed it into Bellflower where they arrested him. Perez, according to police, failed a field sobriety test and was booked into jail. The horse was unharmed and was back with the Perez’s mother. Perez was being held in lieu of more than $50,000 bail. 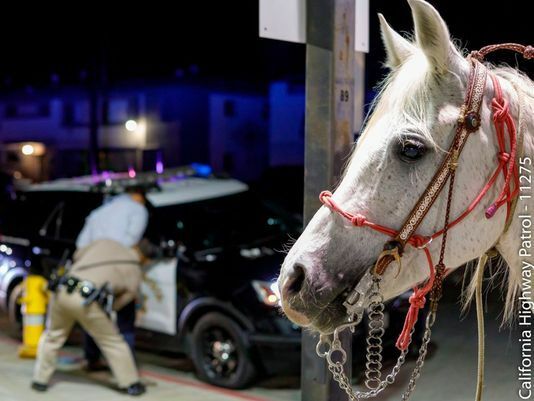 “We get a chuckle out of the interesting situations we encounter from time to time, but one thing the CHP does not do is ‘horse’ around with DUI,” the CHP said on its Twitter account.